Berserker was the Second Fist of Ragnarok before it was disbanded, and is currently a member of Yami's disciple group Yomi. He is a tall muscular young man with spiky dark blonde hair spiked in the back, a red open jacket and gloves on his hands. Berserker is often seen chewing bubble gum and hardly ever speaks. He has a calm disposition despite all the damage being done to Ragnarok and almost never loses his head, despite his seemingly ill-named position. Berserker is said to be the most fearsome fighter in all of Ragnarok, and Loki even believes that he could be a better First Fist than Odin (though Loki may have simply said it in order to plant a seed of betrayal in Berserker). However, Berserker shows no interest in becoming a leader for any gang, and is actually afraid of fighting Odin, believing that the latter is much stronger than he is. Berserker claims to fear boredom more than losing during his match against Hermit. When in his Berserker mode, he's much more sadistic and brutal, going as far as to assault Hermit with everything he has without holding back and laughing maniacally. Berserker is seen usually in the background not speaking when others are talking. He one day plays poker with Loki and Loki talks about making another Ragnarok but states he's joking and the winner would decide who's the leader and when Loki shows he's got a four pair (which he cheated to get) Berserker leaves knowing he cheated and is not interested. However, Loki checked his hand and is shocked to see that he had a Royal Straight Flush and would have won the game. He later goes out and starts taking out all the main members such as easily defeating Takeda, Ukita and the lower grunts. He chases after Niijima and when Niijima tricks him into falling into a hole, he jumps out and starts fighting Siegfried. He defeats Siegfried and almost drowns him and leaves so Akisame and Sakaki can fish him out. Berserker is told by Loki to lead his "New Eight Fists" once the latter proclaims his betrayal of Ragnarok during the attack on Shinpaku Alliance. However once he got close enough, he quickly defeated them all, including Loki, and claims that he only came to Loki just to get closer to attack. He is subsequently challenged by Hermit, who became angry that Berserker took out Loki when he was going to do it. At the beginning of the battle, Berserker's foresight is unable to overcome Hermit's ability to land attacks, forcing him to use odd techniques to counter him. When Hermit gets around those attacks as well, Berserker finally goes into Berserker Mode and overwhelms Hermit. Ultimately, he is defeated by Hermit, who twists one of his arms and unleashes a multitude of devastating attacks. Berserker is unwilling to admit defeat and attempts to continue on, despite his injuries, but is dissuaded by Kenichi, who tells him that one should not be ashamed of defeat because one learns more from it. 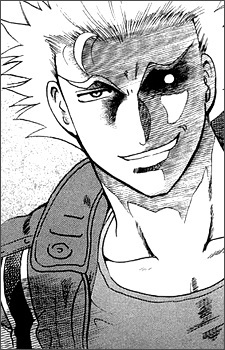 Berserker then stops trying to fight, warns Kenichi about Odin, and is finished off by Odin. Berserker much later would seemingly join Yomi, as a silhouette of him is shown standing amongst three people whom Kensei picked out for disciple testing. After the death of Silcardo Jenazad, Ogata Isshinsai is seen discussing the events with his disciples while looking highly amused. Kokorone Rimi vividly remembers her past encounter with the Demon God Fist, but Berserker remains in the shadows like before, impassively chewing and blowing bubble gum like he did during the Ragnarok Saga. He makes his first formal appearance standing behind his former leader, Asamiya Ryuuto, when the Yomi members are summoned to headquarters by Kushinada Mikumo. Someone throws shurikens at him and the other disciples but he catches it with his mouth and blows a bubble around it while wondering what fights the others have been through so far.